One of the latest tablets released this year is the HP Pro 8. Its OEM, HP is one of the most prominent PC makers. The tablet appears to be a showcase of expertise coming from the HP platform. Even though HP produces Windows operating laptops, the HP Pro 8 features an Android OS. Not just that, it has a rather large battery capacity. Let’s put the intro to a close for now and let’s go into the detailed specs of the HP Pro 8. Having a height of 128mm, width of 210.70mm and 11.90mm thickness, the tablet has a weight of 488g. Its 488g weight makes it not too heavy and not too light at the same time. The frontal of the tablet features the “HP” logo at the bottom bezel while the top bezel houses the front camera and the microphone. The dedicated keys (power button and volume keys) on the tablet are located on the right side. The primary camera, as well as a flash, is located at the top centre position of the tablet’s rear while the large HP logo is also seen to appear at the centre of the tablet’s back. HP Pro 8 comes in a black colour. HP Pro 8 has a screen display of 8.0 inches. Luckily, the name rhymes with its screen display size. Its screen resolution is 1200 x 800 pixels. This covers the sharpness and crispness of texts, images and icons. The pixel density of its display is 189 pixel per inch (ppi). Its display area has a 69.03% screen-to-body ratio. The screen display type is the IPS LCD capacitive touchscreen. It has the multi-touch capability as well as 16 million colours in its screen display. The rear camera of the tablet has a 5MP shooter for capturing memories as pictures. The 5MP shooter has a LED flash support for brightening images in low light conditions. Features of the primary camera include: autofocus, geo-tagging, panorama, touch focus and face detection. The front camera for the selfies has a 2MP lens which lacks the support of a LED flash. The both cameras record videos at 30fps (frames per seconds). The tablet runs on the Android 6.0 Marshmallow. The tablet’s chipset is the MediaTek MT8735. The CPU that powers the tablet is a Quad-core ARM Cortex-A53. The processor clocks at a speed of 1.3GHz, a relatively low processor speed. The graphics processor on the tablet is the ARM Mali T720 MP2. The GPU clocks at a speed of 450MHz. The tablet uses a massive non-removable 6,000mAh battery as its powerhouse. The battery type is the Lithium Ion type (Li-Ion). The tablet has the fast charging technology that makes its battery charge very quickly within minutes. HP Pro 8 was launched in India on September 5, 2017. 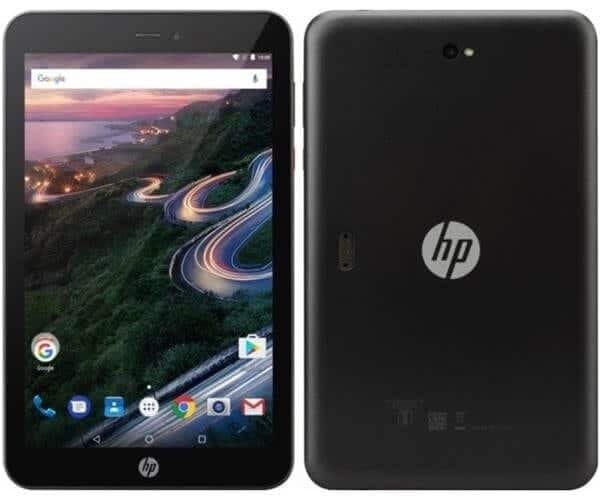 The price of the HP Pro 8 tablet is 19,374 rupees.